We may have packed up all of our belongings and left to go travelling, but we left our hearts in San Francisco. Over the 7 years Jeremy lived in the San Francisco Bay Area and the 4 years I lived there, we amassed a wealth of knowledge about what to do when you visit San Francisco. Our self-guided walking tour of San Francisco made the top of the list for all of our friends and family came to visit San Francisco over the years. We even printed out instructions for our self-guided walking tour of San Francisco along with a San Francisco Walking Tour Map, and included it in a gift basket for out of town wedding guests – and now we’ve made one for you, too! So rest assured, all of our family and friends have field-tested this walking tour for us. Meaning if you don’t like it, it’s their fault. The self-guided walking tour of San Francisco is not only a fantastic way to spend a day when you visit San Francisco, but it’s the perfect way to explore a ton of the city – totally for free! We think it’s one of the best budget-friendly things to do in San Francisco. That said: if you’re looking for a guided tour, here’s a great option that covers a lot of the same ground. Or, if mobility is a challenge for you, these funny looking yellow cars will take you all over the city, no walking necessary! Get your FREE San Francisco Walking Tour Printable Map by entering your email below. We’ll also send you our favorite tips for visiting San Francisco & California! One of the most unique things you’ll learn when you visit San Francisco is how totally distinct each of the neighborhoods are. There are tons of neighborhoods in San Francisco, all with their own culture and appearance and some with their own miniature weather system. You can stand on one side of the street and look across to the other side and see a COMPLETELY different place awaiting you! It’s a totally weird and unique San Francisco thing (here’s a list of a bunch of other weird San Francisco quirks). We designed our self-guided walking tour of San Francisco to include several examples of that quirky San Francisco charm. Overlooking Coit Tower & Alcatraz in San Francisco, California. On your self-guided walking tour of San Francisco, you’ll actually be walking right past Alcatraz and climbing up to Coit Tower! The Financial District: This is where we all work. You’ll see lots of people doing Important Business Things here during the day, but it’s a ghost town after 6pm. The Embarcadero: San Francisco’s beautiful waterfront is home to famous attractions like Pier 39, Fisherman’s Wharf, and Ghiradelli Square. That also means that it’s mostly populated by tourists, but that’s ok – the waterfront is big enough to thin out the crowds. Plus, it’s gorgeous! Russian Hill: Named for a Russian cemetery discovered on top of this hill way back during the Gold Rush, today Russian Hill is primarily notable for being home to one of the windiest streets in the world: Lombard. It’s height and steepness also provide some of the most gorgeous views of the city! Telegraph Hill: My personal favorite neighborhood in San Francisco! This gorgeous oasis is home to Coit Tower, an urban jungle, and – inexplicably – a flock of wild parrots. San Francisco is weird, you guys. North Beach: You’ll hear North Beach described in 2 ways: as Little Italy, and also as the only part of San Francisco with like, a lot of strip clubs (nobody’s quite sure why). But we like it for another reason: it was the home of the 1950’s Beat Movement and home to literary giants like Jack Kerouac and Allen Ginsberg. Chinatown: San Francisco’s Chinatown is famous for being the largest Chinatown outside of Asia. It is immersive. Walk into Chinatown and you’ll think you’ve gone through a portal straight to China. Turn around and you’ll be like, “wtf? I was JUST in Italy.” San Francisco, y’all! Union Square: Located next to the FiDi (Financial District), Union Square is home to both lots of offices and also lots of shopping – plus the only pick-up for the trolley that isn’t on an enormous hill. You’ll see plenty of tourists mixed in with irritated locals who just need to get a freaking bowl of clam chowder in a breadbowl and take it back to their desks. (I used to work in this area, so I speak from a lot of experience). Depending on your walking speed, the amount of transit shortcuts you take, and how many times you stop for a drink or some food (which, if you’re anything like us, is probably a lot) this tour should take the better part of 2-4 hours to complete! Ok, now that you know the basics, let’s begin our self-guided walking tour of San Francisco! 1. Start your tour at the iconic Ferry Building on the Embarcadero, San Francisco’s eastern coastline looking out over the Bay Bridge towards Oakland. The Ferry Building sits on the edge of San Francisco’s Financial District. Although it may seem like this is just a dull business district, there are some surprising hidden gems in the FiDi. Discover them on a Financial District Walking Tour. You can easily get to the Ferry Building from the Embarcadero BART Station, which is accessible from all over the city on MUNI or from the east bay on BART. Or, you can take an actual ferry boat! View ferry schedules here. The Ferry Building Marketplace is home to some of the the best of San Francisco’s many famous food offerings. Our favorites: Cowgirl Creamery, Boccalone Salumeria, and Humphrey Slocombe. Get to know San Francisco’s foodie scene on a Ferry Building food tour or explore the sweeter side of the Ferry Building as part of the San Francisco Chocolate Tour! On Saturdays, there is a huge, excellent farmer’s market at the Ferry Building, so this is a great day to do your self guided walking tour. For some delicious third wave coffee, either stop by Paramo Coffee’s Embarcadero location or Blue Bottle in the Ferry Building. Or hit up any of our other favorite coffee shops in San Francisco! This is Pier 14 on San Francisco’s Embarcadero. You’ll be walking right past it! Don’t forget to stop and take an amazing photo here! 2. Turn right out of the Ferry Building and begin your trek north up the Embarcadero. If you want to speed this section up, you can hop on the famous historic F-Line streetcar. If you decide to walk the Embarcadero (which we recommend) you’ll be treated to some great people watching and the chance to explore the various piers, including The Exploratorium, which is well worth a few hours of your time. Don’t forget to stop and take a picture of the city from Pier 14, too! 3. When you reach an impenetrable wall of tourists, odds are you’ve reached the infamous Pier 39. With stereotypical tourist attractions like Bubba Gump, the aquarium, and Hard Rock Café, this is THE tourist stop in San Francisco (and I don’t mean that in a good way … this is the worst pier if you’re a local). Despite the crowds of tourists, Pier 39 is the best place to view some adorable harbor seals un-majestically basking in the sun. Head into the crowd and make a beeline to the left (find any door through the wall lining the alley) to find the seals. 4. Keep walking north on the Embarcadero and you’ll reach Fisherman’s Wharf. Although this would seem like it’s just another tourist stop, it’s actually got a lot of cool things to see. On the water is a nondescript warehouse that houses Musée Méchanique: an interactive antique penny arcade. You can watch old nickelodeons and feel uncomfortable at the mistreatment of women and people of color. There is also the Boudin Bakery, where you can do a factory tour and watch the making of (and smell) some of the best sourdough in San Francisco. Speaking of sourdough, there are myriad places to get a great bowl of clam chowder in a sourdough bread bowl in this part of the Wharf! Clam chowder in a sourdough breadbowl is one of the classic must-eat foods of San Francisco. There is also an In-N-Out if you have yet to experience one. It means a lot (SO MUCH) to Californians (we are all unanimously obsessed with In-N-Out), but in Lia’s opinion, (formed by spending most of her life in the Midwest), 5 Guys is better, sorry everyone. Local’s Tip: Whatever you get, order it animal style. 5. Continue along the waterfront and you’ll come to Ghiradelli Square. Check out some of the shops here and eat way too much chocolate. They typically give out free samples! Just off Ghiradelli Square is Buena Vista Cafe, the original home of Irish Coffee in the United States. Head to the hidden back room to sit by a huge window overlooking the bay and order an original Irish Coffee or Bailey’s Irish Coffee. Yum! 6. Walk east on North Point and turn right on Hyde. I hope you were looking forward to some iconic San Francisco hills! Continue up Hyde until you get to Lombard St.
You can also hop on our famous cable car and cheat for $5. 7. Once you reach Lombard, take in the view of the famous, needlessly curvy Lombard Street and then walk down it, laughing at the helpless cars trying to navigate the road on your way down. This is my favorite part of San Francisco: it’s beautiful, lush, and green, and you’ll be treated to some of the best views of the city. Dive into the urban jungle and go hunting for wild parrots on a Telegraph Hill walking tour! 8. If you look to the East (hint: towards the Bay) you will see iconic Coit Tower sitting atop Telegraph Hill: that’s your next destination. We’re going to take the long way! Go north on Leavenworth, then turn right on Bay Street. Continue on Bay Street until you hit the Embarcadero again. Turn right. After a couple of blocks, turn right again onto Sansome. 9. When you reach Greenwich, take one more right. Ascend the stairs, but take your time. There are plenty of cool things to see, including public gardens and the best views of the bay in the city. When you come back out on a street, continue towards the right. You’ll see an abandoned restaurant (you can’t sneak in; we’ve tried) and a brick staircase. Continue up the steps to ascend the last bit of Telegraph Hill. Be on the lookout for the wild parrots of Telegraph Hill – this urban jungle is filled with them! To learn more about the Wild Parrots of Telegraph Hill, check out the documentary of the same name. 10. You’ve reached Coit Tower. You can pay the fee and climb the tower if you’d like. Take a break and enjoy the view; you’ve earned it. North Beach is a fascinating neighborhood that’s home to both Little Italy and the Beat Movement. If your visit allows for it, we recommend taking a North Beach & Little Italy Walking Tour! Or, just eat your way through Italy on a culinary tour of North Beach. 11. Walk down the driveway of Coit Tower until you reach the stairs on the left. Follow that staircase west until it hits Filbert St, and take Filbert. Turn left on Stockton. This is Washington Square Park. It’s also the Little Italy of San Francisco. If you feel like some pasta or tiramisu, this is the spot. 12. Walk south on Stockton until you reach Columbus Ave, and go left on Columbus. You’re in the heart of North Beach now, which is San Francisco’s Little Italy. There are great restaurants, bars, and gelato on this street. Be sure to stop if you feel like having some pasta or tiramisu! The Sentinel Building is Jeremy’s favorite building in San Francisco. But Lia likes the Transamerica Pyramid, that triangular looking one right next to it. How about you? 13. When you reach Broadway and Columbus, you’ve traveled back in time to the center of The Beat Movement. Grab a drink at Vesuvio, in famous Kerouac Alley, like you were Kerouac himself. Sit upstairs by the window and brood. 14. Once you’re done being Kerouac, head back to the street. Look down Columbus and you can see the famous Transamerica Pyramid! In the foreground though, you’ll see Jeremy’s favorite building in San Francisco: The Sentinel Building, that awesome pie-slice-shaped green building. 15. Walk through Kerouac Alley away from Colombus and you’ll suddenly be in Chinatown! Aren’t San Francisco neighborhoods crazy? Chinatown in San Francisco is the largest Chinese community outside of Asia, and the oldest Chinatown in the United States. It has a rich and colorful history and is a fantastic place to visit. If you have a chance, we recommend taking a Chinatown Walking Tour to fully explore this amazing neighborhood – or, if you’re up for it, an after dark Chinatown Ghost Tour! Walk down Grant, have some Chinese food – pick a bakery, any bakery – and check out the trinket shops. We recommend stopping in Ross Alley to visit the Fortune Cookie Factory to watch how Fortune Cookies are folded by hand, and to pick up some hella cheap fortune cookie rejects (and that incredible waffle smell). When you reach Grant and Bush, you can see the famous Dragon’s Gate. This is how most people enter Chinatown, but it’s how you’ll re-enter the Financial District! 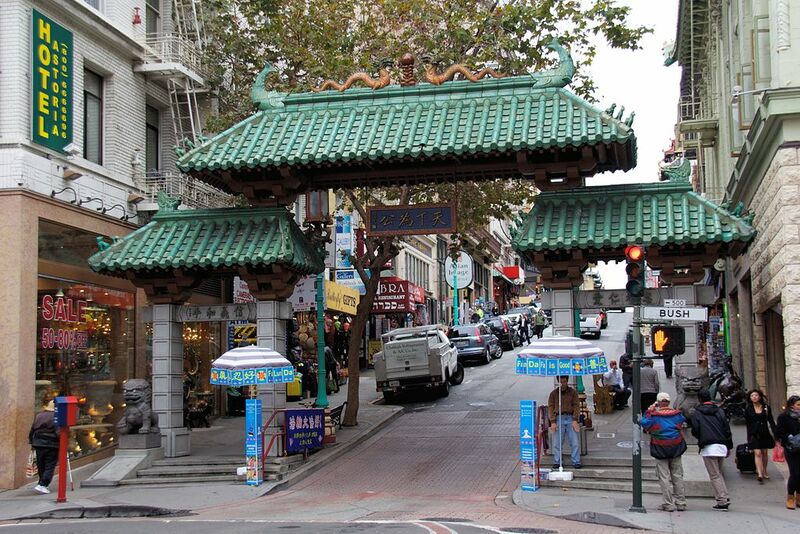 The Dragon’s Gate is the entrance (or in your case, exit) to San Francisco’s Chinatown, which is home to the largest Chinese population outside of China! 16. Pass through the gate, and you’ll be in the Union Square neighborhood, part of the Financial District. Continue to Post and turn right. In a couple blocks, you’ll be in the Union Square plaza, where you can take a photo with an iconic giant San Francisco heart statue! If you’re looking to shop, this is the neighborhood to do it. Every famous clothing designer in the world has a store here. For some of the best views of this area, head into Macy’s overlooking Union Square! The higher you climb, the better the views will be. Even if you’re not staying there, the Westin St. Francis is worth a visit just for the beautiful lobby and the 2 amazing glass elevators, which you can usually sneak into if you walk purposefully behind someone who has a room key. Exit on one of the highest floors and find a fire escape for some of the best secret views of the city! 17. Walk across the plaza, you’ll reach Powell Street. Walk downhill (follow the cable car tracks) and you’ll reach the Powell Street BART station, where you can take a BART or MUNI to anywhere you like. Or, if you’re super eager to keep walking, just head 20 minutes east on Market, and you’ll end up back at the Ferry Building where you started! Congratulations, you’ve just completed an intense 6-mile self-guided walking tour of San Francisco! Finding a detailed self-guided walking tour of San Francisco online is great and all, but pulling out your phone to check every step isn’t a good idea (in fact, we advise against it – that’s how everyone we know has had their phone stolen, including us. Basic travel safety 101!). Instead, we’ve made a printable map of the self-guided Walking Tour of San Francisco! It’s formatted and shortened to fit onto one easy to print page: directions on the front, map on the back. Super handy! Before you embark on your journey, here’s a couple of tips to follow when you visit San Francisco from us locals. We actually have an entire post full of mildly helpful tips like these: check it out here. Because you’re in notoriously chilly San Francisco, always bring a jacket, even if it’s sunny (at the moment). It gets cold at promptly 6pm or wherever Karl the Fog is lurking. Yes, we named our fog. He’s adorable. Never, ever, EVER call San Francisco “San Fran”, “Frisco,” or any other cutesy nickname. It makes our ears bleed and we get uncharacteristically pissy about it. If you must use a short name, SF or The City are both acceptable. You will see a lot of homeless folk. Don’t be nervous. They are in far more danger than you are, and they will not hurt you. Treat them with compassion and kindness – it costs nothing to smile and wish someone well! If you take BART, there are 2 unspoken rules, and everyone will get silently cranky if you don’t follow them. Rule 1: On all escalators, stand on the right, walk on the left. Rule 2: Line up on either side of the doors to wait for your train. Even if the next one is or isn’t your train. Just stand in line. About that line thing: anywhere you see people standing in line in San Francisco, it’s a best practice to just quietly follow suit. We love standing politely in lines (see evidence here). San Franciscans once stood in line for hours just to get some day-old bagels flown in from New York City (no, I’m serious). At first I thought that was ridiculous, but after years of living here, I totally get it: San Francisco has awful bagels. Once, I was standing in a long line for Hot Cookie in the Castro at 11pm and somebody came up and asked me incredulously, “Is it … is it just cookies? !” “Yes,” I said, “But some of them are shaped like dicks.” It was at that moment that I knew I was a true San Franciscan. Be wary of opportunity theft, particularly when it comes to your phone. Do not use your phone on the street or on public transit. Everyone I know has gotten a phone stolen in San Francisco. For this reason, we’ve created a printable version of our walking tour so that you don’t need to use your phone! Sign up below. Psst: Brush up on all of our travel safety tips. Enjoying the views from the Westin St. Francis hotel in Union Square, San Francisco! We hope you enjoy your visit to San Francisco! Have any questions about the city? Leave us a comment below! Did this post make you want to explore San Francisco? Save it on Pinterest! Full sized images can be found by clicking the Pin It button. I’ve done this walking tour and it was truly magical! Thank you for the suggestions, you guys are my favorite! Thanks so much for all this wonderful information! I can’t wait to try out this Walking tour! I went to San Francisco last year for my first time as part of my Pacific Coast Highway motorcycle trip. It is, without a doubt, one of the GREATEST cities in the world. I’m planning to back this year and take in some of the things that I missed the first time. You can’t do it all in a few days – I’m staying for a week, and plan to do this walking trip. Will report back. Thanks! I mean, we’re pretty biased, but you’re super right. SF is the best and we’re obsessed. We’ll be posting tons of SF related content soon, so check back before your trip! I can’t get the link to work for this printable walking tour map, could you send it to me? Absolutely! I’m so sorry to hear that it wasn’t working for you. We’ll try to figure it out. hi i’m trying to download the printable map, but it isn’t working for me. how else can i subscribe and get the map? Hi Molly, I’m so sorry to hear that! I’ve sent you an email with the map. Hope that helps! Hi, I am trying to subscribe to get the map but it isn’t working for me. Is there another way to get it? Hi can you send the printable map to my email? It won’t let me subscribe. Thanks. Hi Shay! I’ve sent you an email. Thanks! I click to get the map and it just takes me to the email sign up which I already signed up for. 🙁 Please help. Hi Matthew, I’m so sorry to hear that! I’ve sent you an email with the map. Please check your spam inbox in case it landed there somehow! Please send a printable copy of the map! Thank you! I look forward to going on this walking tour! I subscribed (I think) but I did not received an email. Can you check it out for me? It looks great and I would like to use it. We are leaving for San Fransisco this sunday. I can’t find a place to enter my email address. Could you please send me the map please? Hi Karen, I sent you an email! Check your inbox. I requested the free printable map, but haven’t received an email. Can you send me the info – I’m leaving for SF in 5 days! Thanks. I’ve sent you an email, Laura! Check your inbox. Can I get a printable map too? I susbscribed to your email list to get the map but I have yet to receive anything? (I did check my junk folder 😉 ) I was wondering if you could send it to me? I am really looking forward to the walk, I’m coming all the way from Melbourne Australian in October and am VERY excited!!!!! Just sent it to you! That’s super exciting 🙂 You’re going to have a great time! Can you please email me the map? Sent! Take a look at your inbox, you should find it there. So excited about this! My sister and I are going the first week of October. Would love to do this walking tour! Thanks the great post! This looks like fun! Would you please send me the printable version and map? Just sent it to you, Heath! Keep an eye out in your inbox. Hi, can you send me the printable map? That would be great as we are currently in San Francisco. Sure thing! Just sent it to you. Enjoy your trip! I’d love a printable map!! We’re going to the city this weekend! Sent! Take a look in your inbox. can you send me the map as well please. I would also like to try this adventure this year. Sent! Check your email for a message from us. Can you send me the link to the printable map? I subscribed however I did not receive an email. Thank you! Could you send to me too? Taking relatives to the city and would love to get your map. Thank you! Sent, please check your email! Would love this map please. Sent! It’s in your inbox. going to San Francisco in a couple days and would love a map too pls! Thanks so much! I’m going to San Fransisco in a week for the first time (and actually first time to the US as well), and i’m definitely trying your tour! Can’t wait! can you send the printable map please? thank you! Hi I subscribed a while ago and downloaded the map but then my computer died and I lost so many files (I was heartbroken!) Is there someway I can get another copy? Hi! Headed to SF tomorrow for a quick anniversary trip. I would love a copy of this map, if possible. Thanks! Sent – check your inbox! SO HAPPY to have found this walking tour. Thank you for putting it together and sharing it. I was looking for a tour to cover a decent variety of SF in one day. I’ve been a couple times before but wanted a well rounded tour for when my sister and I go in a couple of months. I would love a copy of the map and walking tour. Would you be so kind as to email me a copy. Thank you very much. Can you send me the map as well? Going to SF in a week. Your post is very informative and we’d like to try it next week! It won’t let me sign up! Can you please email me the map? Hi, really looking forward to this tour! can you please send the map to me? How do I get access to the walking map? I signed up last night, but I haven’t received anything yet! I signed up but did not receive the map. Can you send it? Sending that your way today! Could you please send me a map! Thanks! Subscribed by haven’t received an email with anything. Would it be possible to send? Hi Tim, looks like we may have ended up in spam. I’ll send you the map, make sure to add contact@practicalwanderlust.com to your address book so we don’t end up in spam again! We leave on Sunday, 3/18/18 for our first time to the west coast! Starting in SF for 2.5 days then driving down the PCH to San Diego! So glad I found this walking tour I was getting overwhelmed with all the things I want to see and trying to come up with a strategy to see them all! Now I have to figure out “where” some of these place are that I want to see are located on the map so that I can make sure to incorporate them into your map! So glad I can help cut down on the overwhelm! The good news about San Francisco is that it’s a totally walkable city (well, if you don’t mind the occasional steep hill, that is). Pick a spot or a couple of adjacent neighborhoods and you can just explore by foot! 1) What attire do you suggest for weather in the middle of May? I’ve been told windbreaker and hoodie. 2) Would it be difficult to take a bike on this tour, or should I just walk? I will be starting from Union Square and making my way backwards. Hey Tiffany! Honestly it’s a tossup and the weather could swing anywhere from 55 to 75 in one day depending on which parts of the city you’re in. So yes, always bring layers – a hoodie and a windbreaker is definitely a good place to start (never assume it will be warm in the city). Parts of this tour are not bike friendly, especially the bits around Coit Tower and Lombard. And if you’re starting in Union Square, you’re going uphill for the first part of the tour into Chinatown. The most bikeable parts are really just up and down the Embarcadero which is nice and flat, and they do have bikes you could rent on the street for that bit! Thanks! I think I will just get some comfortable sneakers and skip the bike (probably just more to drag around in the long run). Hoodie and windbreaker – got it! Thanks for the help! I’m really looking forward to taking this tour. Great article! Many thanks. Can you please send a link to print the map? Since this tour nearly wraps around to your beginning point, can you make a suggestion as to where to park between Powell Street and Embarcadero? Honestly, I wouldn’t go near that area in my car if you paid me 😛 and you would have to pay me, because parking anywhere near there is gonna cost around $20. Don’t do it! There is soooo much public transit up and down Market street and all over those areas – even taking a Lyft from somewhere else in the city is going to be easier/cheaper than trying to drive and park. Thank you!!! Good to know. Not sure if this was already asked —which area should one avoid. You said about phones being stolen —which area should tourist be extra careful or guarded. Hey Jose, you really want to be careful throughout the entire city when it comes to petty theft. There’s always a risk of having your phone or bag stolen if you’re not paying attention. Someone once tried to steal mine as I was leaving work and walking the 10 feet from the front door of my office building down into the BART station, right on Market in the financial district at 5pm on a weekday – aka there were tons of people around also leaving work at their offices. Didn’t matter a bit. Same thing with bags – never put them on the floor near an open door or somewhere easy to grab. Never leave anything in the backseat of your car as someone will break your window and take whatever’s in your backseat. Just have a general sense of caution around you if you want to take your belongings back home with you! That said: petty opportunity theft is not DANGEROUS, persay, just irritating. Make it harder for people to steal your stuff and you should be just fine. If you want to know where I feel nervous walking alone at night, I’d say the Tenderloin or Civic Center, but Jeremy feels perfectly safe in those areas because he’s a dude and also because he’s lived in those neighborhoods. I am having trouble subscribing to your mailing list and get the map. Could you send to me? Hi Robert, could you try again to subscribe? Maybe there was a glitch! When you have done that we can send you the map through your link 🙂 Hope that helps! Hi there – great article – Can you send me the map? Hey Nadiele! Glad you liked it! We have sent you an email, you just need to confirm your address via the link in the email and then we can send you the map. Hope that helps! Can you send the walking tour details please? Hey Margarita! We have sent you an email, you just need to confirm your address in the email and we can send the tour through for you!